Thanksgiving; it’s the time of year to eat, drink, relax with family, and, of course, shop. Its convenient timing, a month out from Christmas, has made it an increasingly popular event in the shopping calendar. But not every deal-hunter, armed with laptop and feigning interest in the Thanksgiving football specials, has Christmas shopping on the mind. After all, giving is in the name, even if it’s gifting yourself that ugly Christmas sweater you've had your eye on. Thanksgiving is defined by tradition, and nothing says tradition like a one hundred dollar plasma screen TV. Such seemingly crazy deals are a common occurrence on Black Friday, the day following Thanksgiving, now known as one of the business shopping days in the United States. 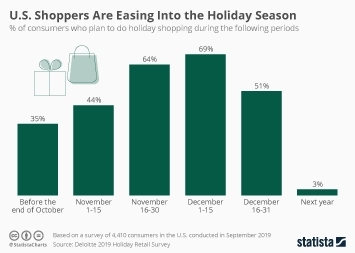 Black Friday shopping has become a tradition of its own, with 39 percent of shoppers citing tradition as a reason to fight off that snotty nosed teen for the last 75-percent-off waffle iron. Though images of stampeding customers on Black Friday will be beamed around the world, Thanksgiving weekend shopping has increasingly moved online. A large part of this change was fueled by the creation of Cyber Monday, a marketing tool used by online retailers to encourage online shopping. Now more than a decade old, Cyber Monday digital e-commerce spending totaled almost 3.7 million U.S. dollars in 2016. Given that 73 percent of those who shopped online on Cyber Monday refrained from shopping in-store as well, it seems people are keen to avoid Armageddon-like scenes in the nation’s malls where possible. Perhaps it is the tech-based name, but many shoppers still believe braving the storms of Black Friday will yield better deals than Cyber Monday if you are looking for something other than a phone or laptop. A Statista survey of shoppers gearing up for Thanksgiving weekend shopping in 2018 showed that 37 percent of shoppers expected the best deals for toys to come on Black Friday, compared to 19 percent who thought Cyber Monday would be best. Regardless of what you are looking for, it is likely to be on sale at some time during the Thanksgiving weekend. Just don’t forget to spend some time with family, teaching grandma how to use that new tablet you got her last year. Topic: National holidays in the U.S.
Topic: Thanksgiving in the U.S.